But you must pick an area of scope that is of the highest priority, assess and work reasonably within your means and stick with this doable plan for a succession of years. Lesser Celandine, also known as Fig Buttercup and scientifically as Rununculus ficaria is that plant with the yellow flowers found on floodplains and wet areas in the early Spring. 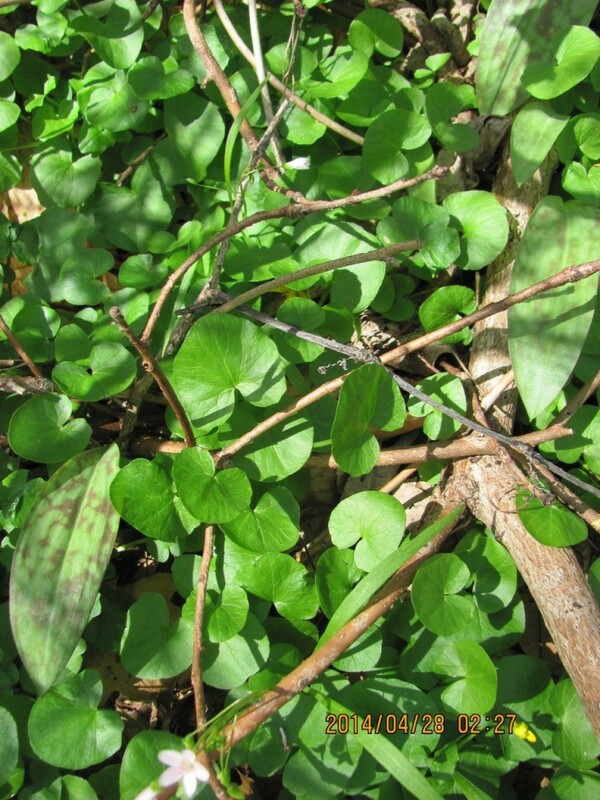 It creates a uniform and dense matte of green, often before other plants begin to photosynthesize. 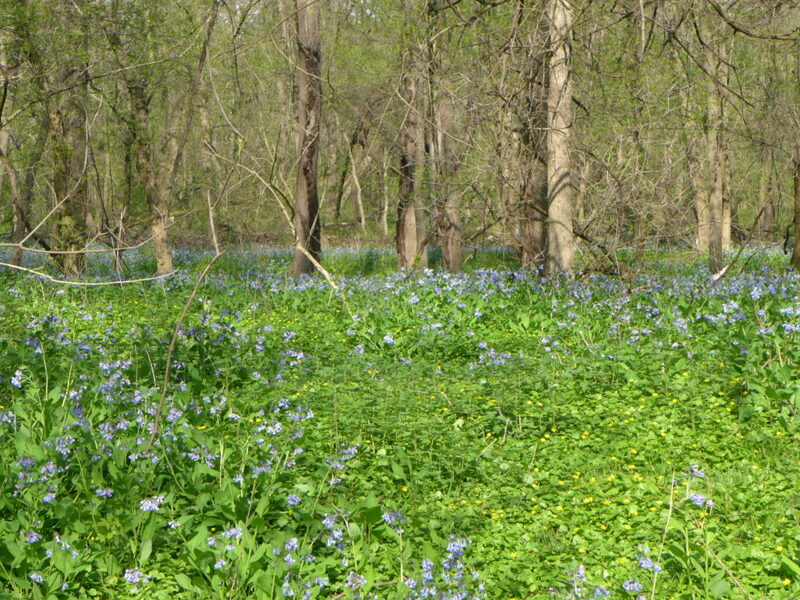 This early arriving strategy gives this European introduction an advantage over other plants, allowing this species to gain a strong foothold, crowding out and locally extirpating the native flora. The Rununculas ficaria also creates a massive and thick underground structure, composed of a mass of bulblets and roots, so dense that there is little room for other plants. This dense aggregation of bulblets and roots is adept at consuming all of the moisture in the surrounding soil. The plant then goes dormant by late spring, turning yellow and just disappearing from sight, leaving behind a wasteland of dry, barren ground where little will grow. Below this is the massing of dormant bulblets, pressed together side by side, creating a difficult to penetrate sheet of plant material. If there is any flooding or erosion, the bulblets are just carried downstream ready to repopulate yet another area. Many a land manager has thrown up their hands in despair as they watch acres of riparian areas completely covered and see it crawling up the slopes year by year. 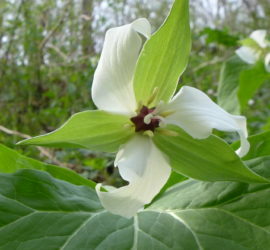 It has the usual story of ascendence into the forests of Eastern North America: introduced as a garden ornamental over 100 years ago, it escaped from gardens and has become a noxious invasive. Land Managers, wildflower and bird lovers, butterfly enthusiasts and the curious observers of the forests you encounter: Today we have a special edition for you: We will tell you how we successfully eradicated this plant from a completely infested area, and we will also show you pictures of the many native plants it threatens, further detailing with actual evidence the usual commonplace phrasing that goes something like: “this invasive the (fill in the blank) crowds out the natives”. We are going to show you this in action! Take a look at these plants actually being pushed out before your very eyes! 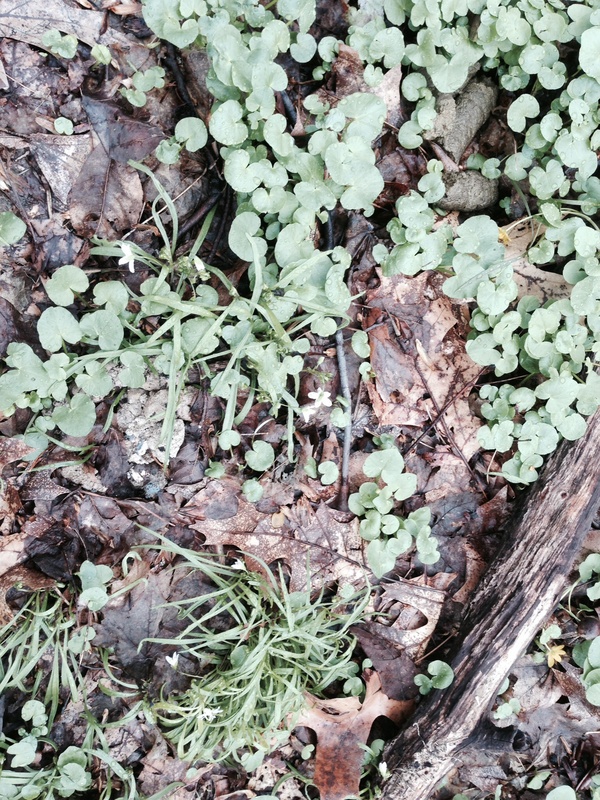 Here is Trout Lily and Aster surrounded by a sea of Lesser Celandine. 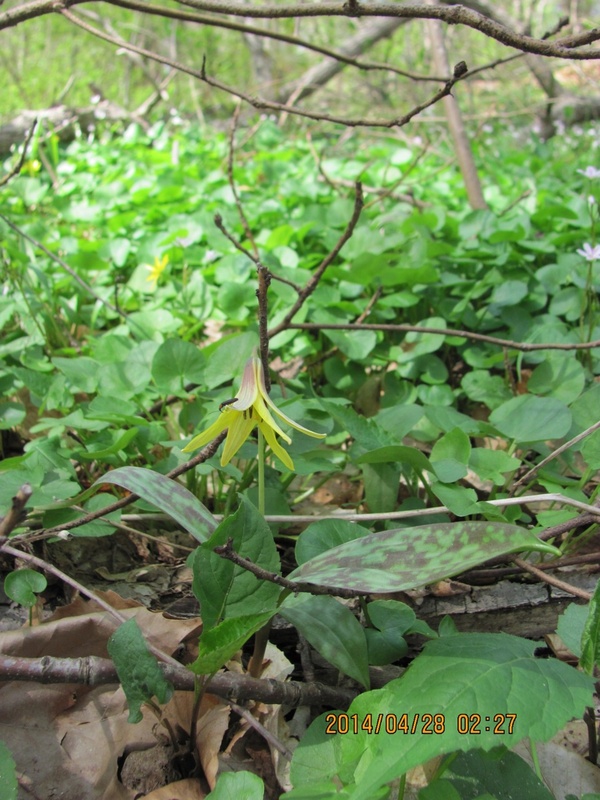 It is really sad to see the Trout lilies go because they often form a complex network of underground structures that reach about a foot below the surface , creating stable slopes that can resist erosion and allow for the regeneration of trees and shrubs. 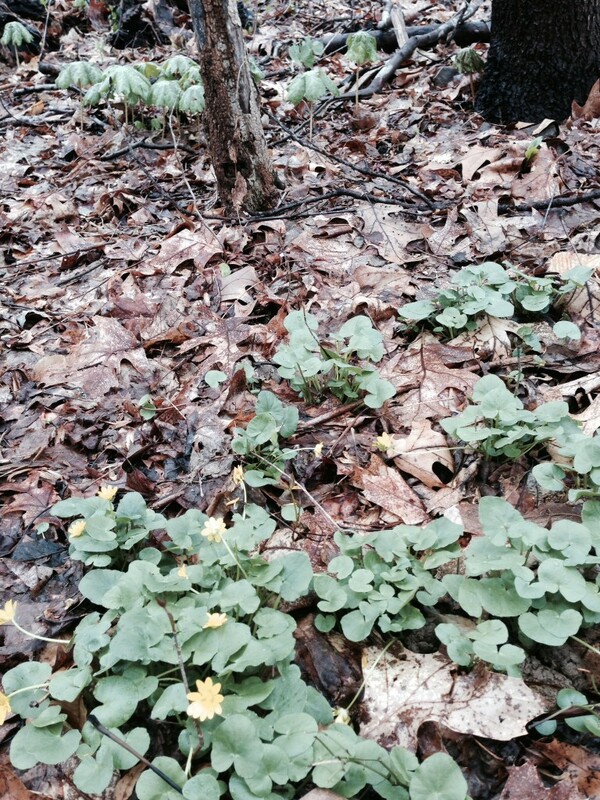 The Lesser Celandine only exists on the top 3 inches of soil and inhibits the germination and growth of trees. 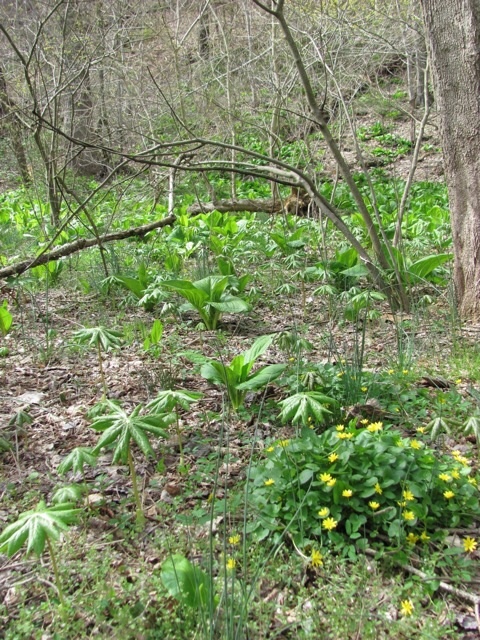 These Mayapple are being consumed by a tsunami of Lesser Celandine. Mayapple fruits are a source of food for the Eastern Box Turtle. 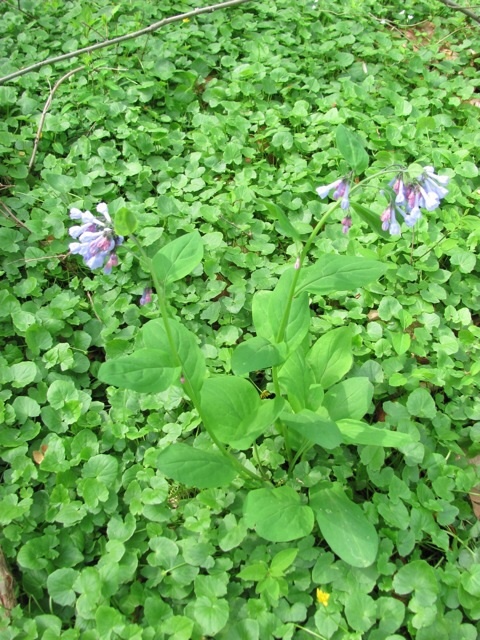 These Virginia Bluebells, the Mertensia virginica are barely holding on as this onslaught of Lesser Celandine takes over. 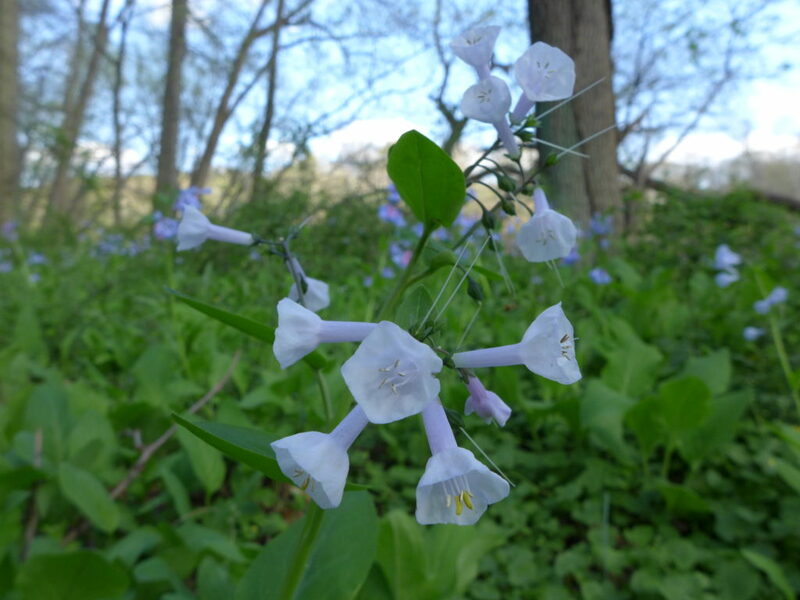 These Bluebells provide nectar for hummingbirds, at a crucial time in their long hard 1000 mile+ migrations from Mexico and other Central American locales to your backyard in The Northeastern parts of North America. 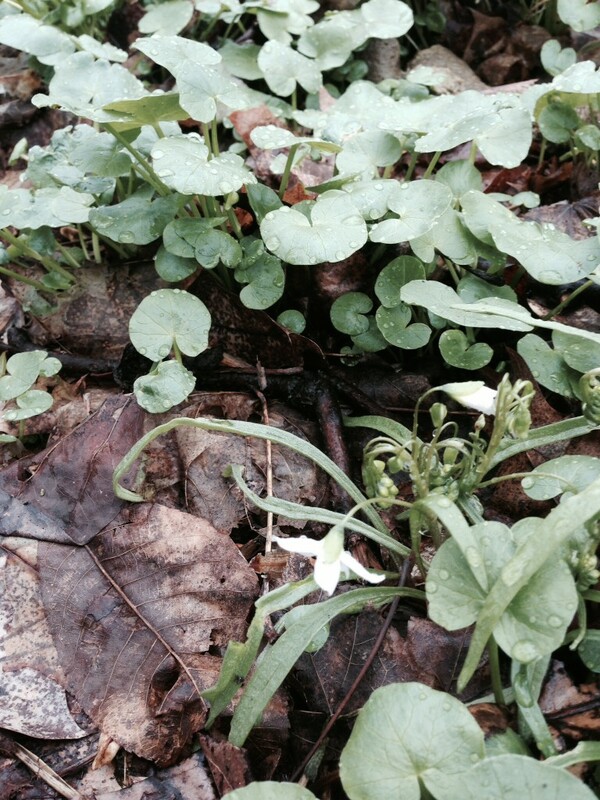 The Spring Beauty, Claytonia virginica is surrounded. Back to the Trout Lilies, almost gone! A wave of Lesser Celandine races towards this Bloodroot, an early Spring ephemeral beauty that is an important source of nectar for a variety of bees and other important pollinating insects, who have just arisen from dormancy and are desperate for nectar. 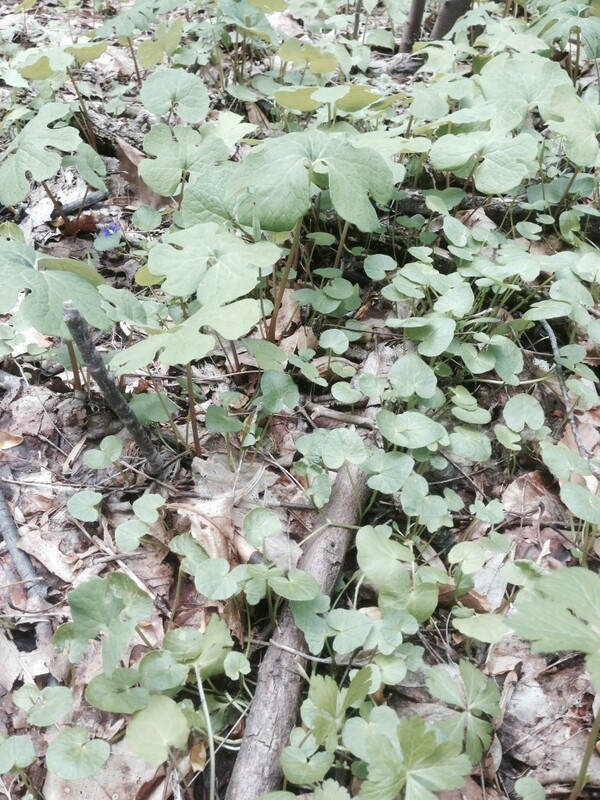 The bloodroot is now engulfed. Will it survive? What will happen when it is extirpated from this area? How many other species will die and what will be the cumulative result of that? That is where you come in. These wonderful wildflowers and their associated bees, hummingbirds, butterflies and turtles will survive if you want them too. Throw your hands up in despair and do nothing? You can do that and it may be the best thing to do, your area of concern is invaded for acres and is completely overwhelming and your environmental stewardship time may be better spent elsewhere, perhaps gardening or focusing on other invasives, visiting other sites, broadening your perspective. This site is a perfect example of one that we recommend for eradication to be implemented. 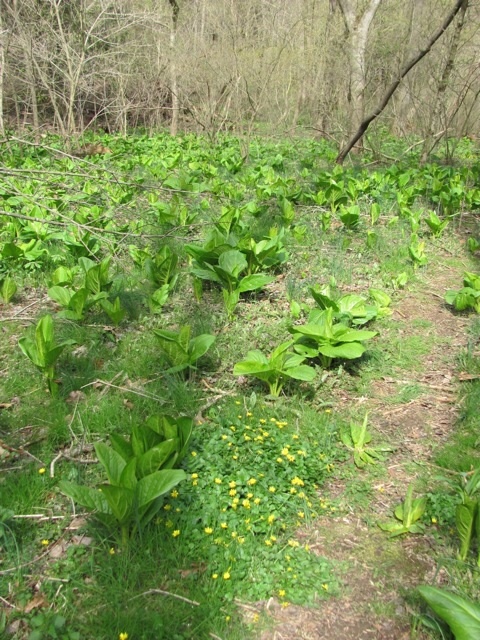 It is mostly intact with Skunk cabbage, Mayapples, Spring Beauty and Trout lilies all growing in a floodplain in the Tuquan Glen Preserve, an area of astounding beauty that has active volunteers that remove Garlic Mustard on a regular yearly basis, with much success within their area of scope. 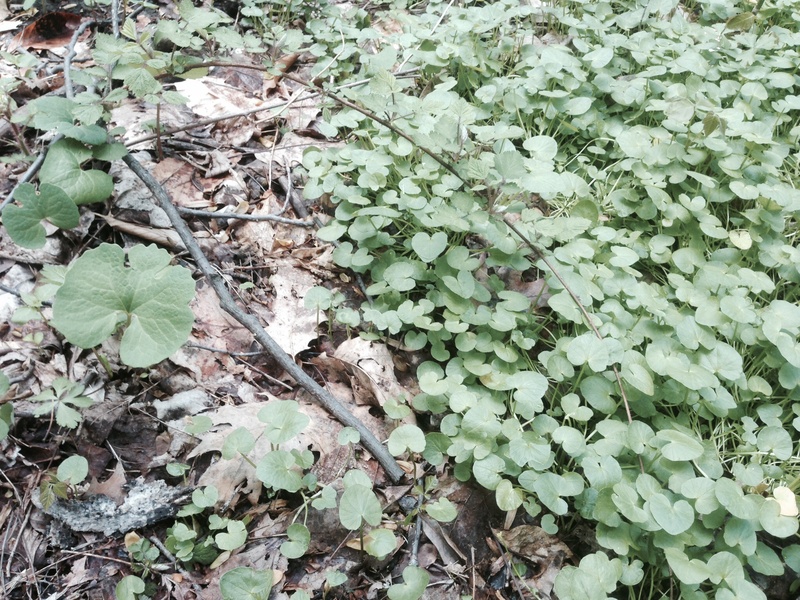 As can be seen above, there are isolated pockets of Lesser Celandine that could be targeted for hand pulling and disposal (one option) without too much worry about accidentally pulling the natives. Just pull out, bag and dispose of this one patch and we are in good shape, as long as yearly monitoring is implemented. So basically, given the infestation and the conditions, we have to assess our resources, can we pull out this area, and come back next year and pull out what we missed and so on the year after? Can we be careful to not pull out the native plants, is our team skilled at this? Do we have the money for the bags and the disposal costs? If the area is big, but we want to do something, where do we start? 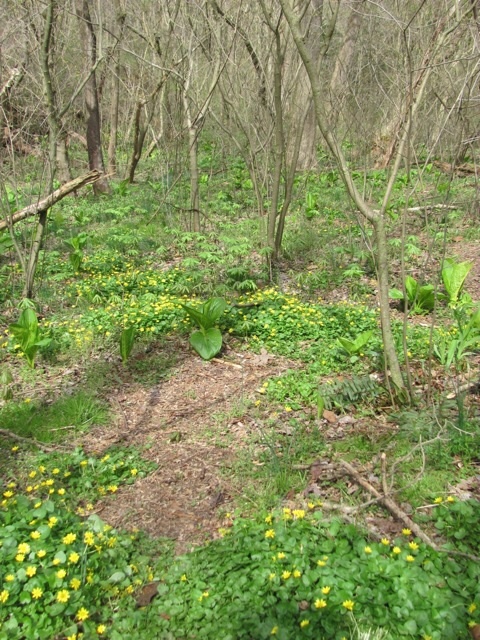 Starting in an area that has lots of native plants, but has patches of Lesser Celandine coming in is the best option. Start on the edges and work your way in. Try to prioritize the areas threatened and push back the threat. The surviving plants of your area of scope are the most important resource to be protected- these plants and their genetic heritage are the most valued asset because they are the most suited to this specific area, and they are supporting the remaining wildlife as well, there are migrating birds depending on these plants, the insects they eat, as well as the birds and mammals that want to actually live in this place. What are they going to eat? If you keep at it and the area of scope is reasonable for your means then one day you may reach the core affected areas and when you get in there you can collect some seeds from the neighboring surviving natives and re-introduce them. 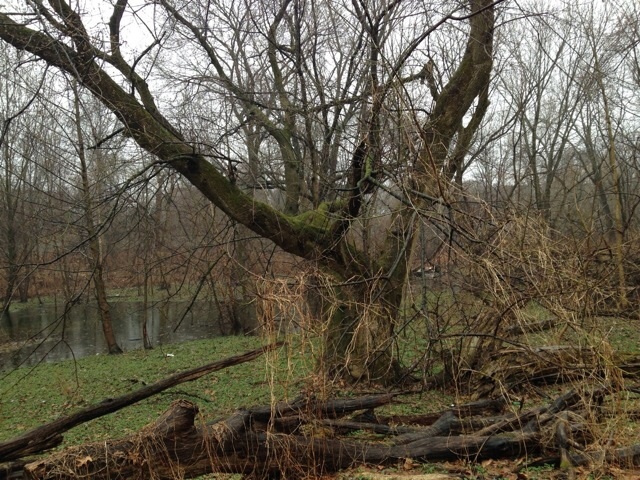 After a grant was awarded in the thousands or even millions to eradicate this species from the site, the few native plants growing on this floodplain would be temporarily relocated to a nearby safe zone (here is where the volunteers would be of great help). Then professional crews would apply wetland-grade herbicide to the whole area at exactly the right times of the year ( as early as possible in the growing season to avoid damaging other, later emerging plants) This process would have to be repeated yearly until enough invasive material was removed that then a more hands-on approach could be implemented- monitoring and hand -pulling the remainder of the population. The native plant safe zone could then be used to collect seeds to re-seed the area, and some of these plants could be also relocated back to their original spots. Thought could be given to plants long ago extirpated and there could be an introduction of these species as well, with respect to the local genetic provenance using locally sourced plants. 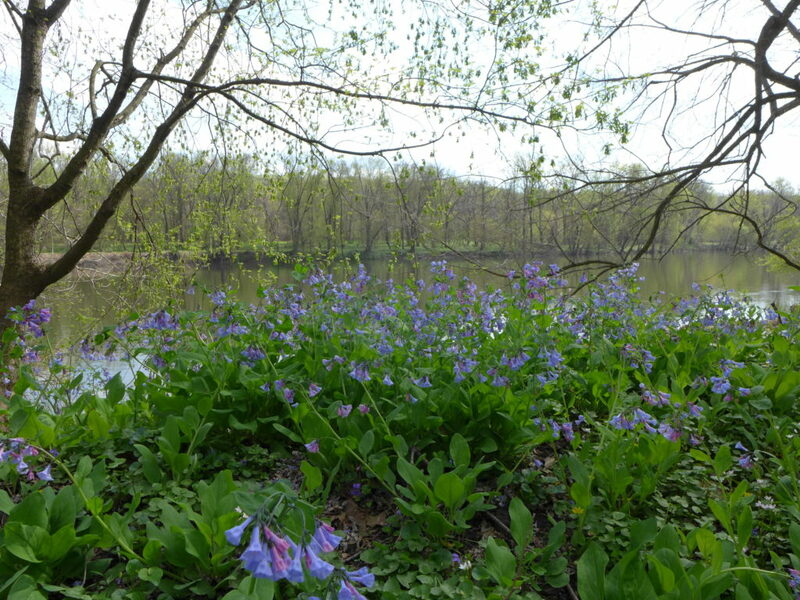 Some of these riparian areas are in parks and natural areas in large metropolitan districts. a 2 or 3000 square foot house can cost as much as 1/4 to 3/4 of a million dollars in the immediate vicinity of these locals- why not invest as much in the 30 acres + of riparian area in the parks nearby, so these homeowners can enjoy the natural beauty of these places, instead of seeing a biological dead zone throughout most of the year while on their walk, stroll or run? 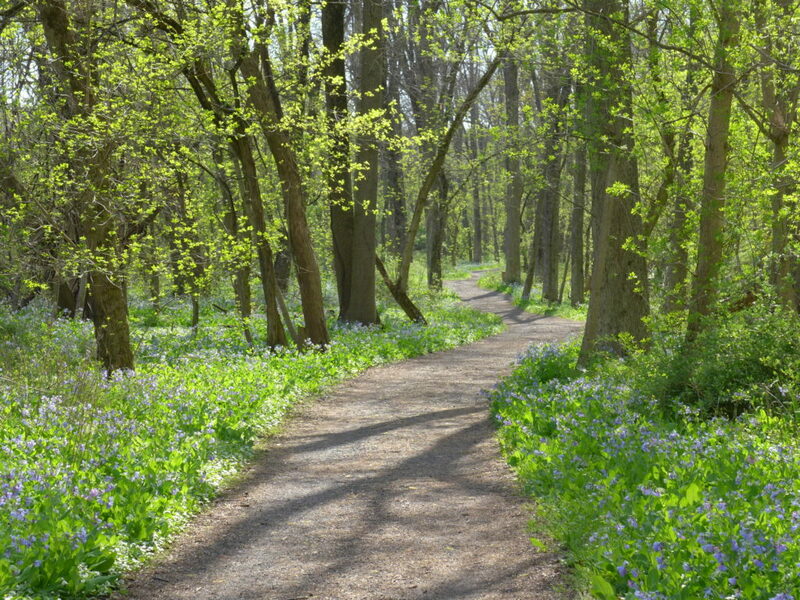 From a price per square foot perspective, to buy back these natural areas is a real deal! It can happen! 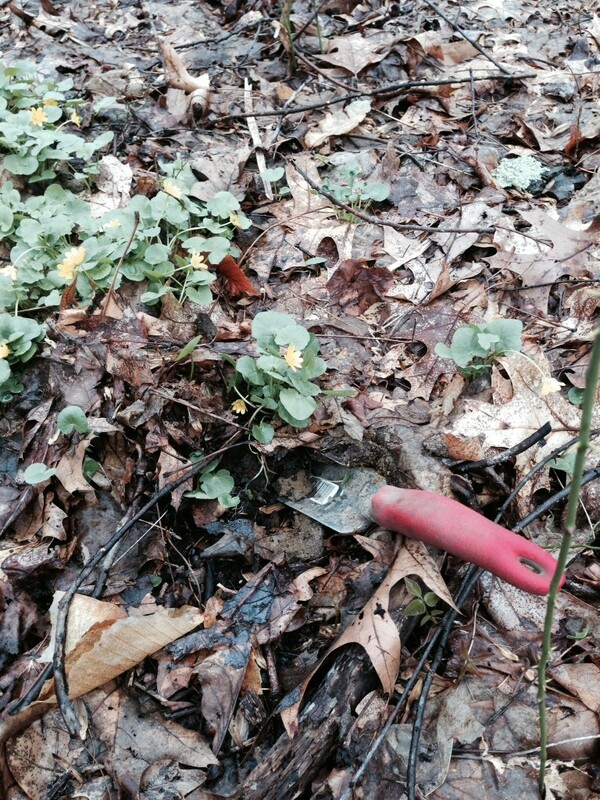 Why should the degraded floodplain or forest near you be left to the Lesser Celandine? 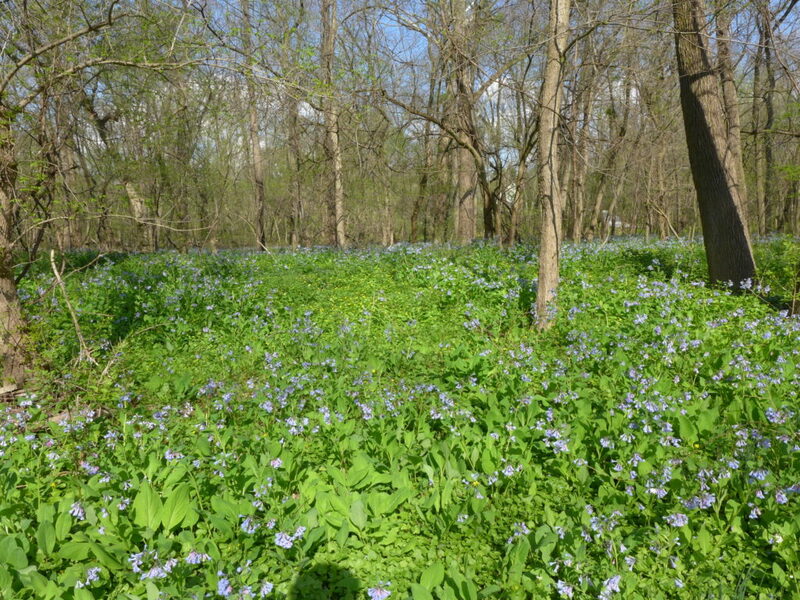 Above is an area once dominated by Garlic Mustard, Burning Bush and Multiflora Rose. 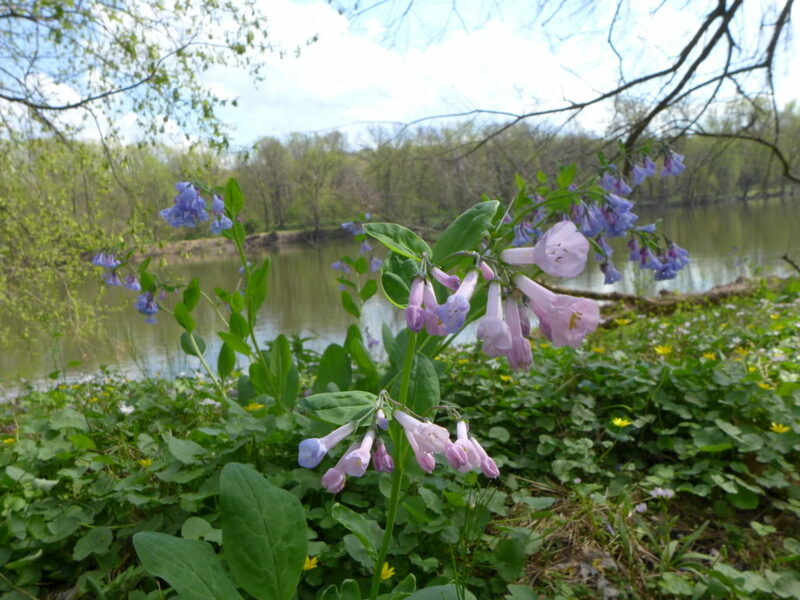 These invasives have been eradicated, at least for now. All of this underneath a grand Scarlet Oak tree. 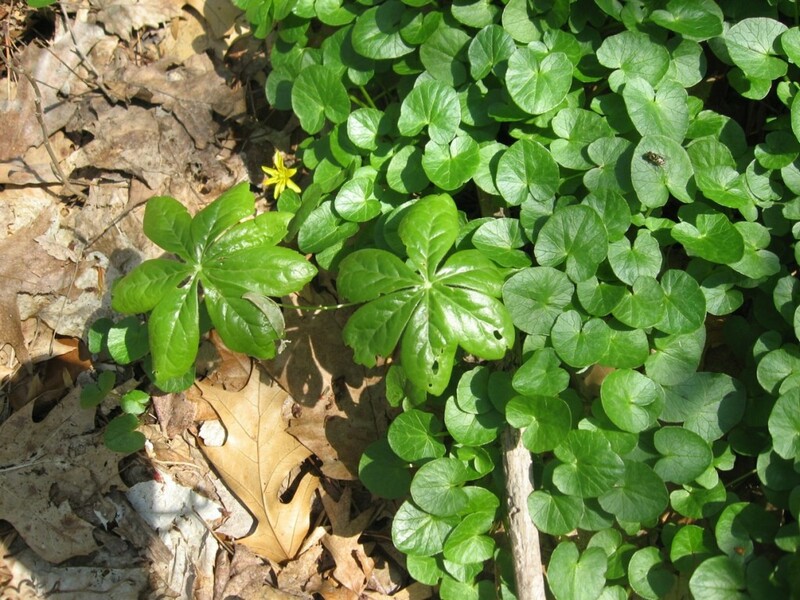 What is left are isolated patches of Lesser Celandine, this specific patch near some emerging patches of Mayapple and Bloodroot. We are just now starting to see Scarlet Oak seedlings emerge as well, although the deer usually eat some or most of them (depending on the area and the Deer population levels). 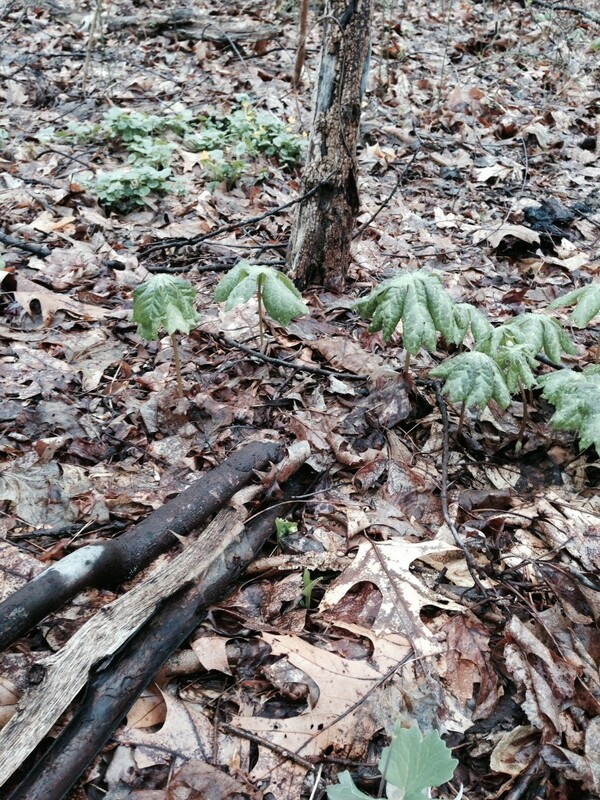 This isolated patch about 2 feet in diameter was removed in ten minutes using a garden shovel, pushed up underneath the root structures, while pulling by hand the leaves and stalks, while the plant was blooming. This effort was undertaken after some rainstorms, so the soil was loose, allowing the easy removal of the bulblets with the minimal loss to the soil in the bagging and disposal phase of this operation. Here is the “before” picture. And here is the “after” picture, about 10 minutes later. 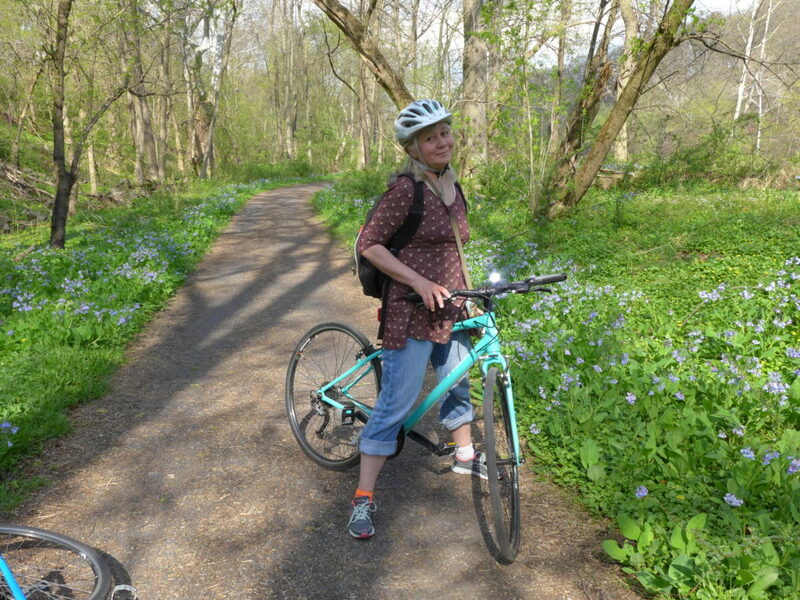 We prioritized this isolated patch over digging into the acres of Lesser Celandine that have invaded nearby areas of the park. It is sort of like putting out the fires that we can put out. We have been trying to maintain this one patch of Spring beauty.Since we started 5 years ago, the Spring Beauty has “sprung” back and is much larger, but still has Lesser Celandine looming close by. So far we have eradicated successfully an area of about 750 square feet by using the shovel-under-and-lift-out-and -bag technique when the soil is wet. 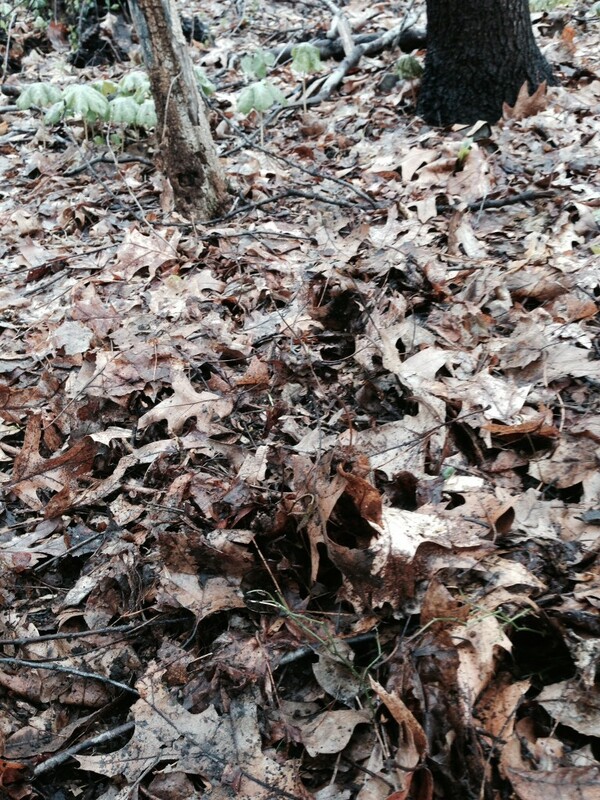 We have kept the loss of top-soil down to a minimum, but this technique will inevitably lead to some soil loss as well as a loss of bio-mass (like with Garlic Mustard removal) from the site. 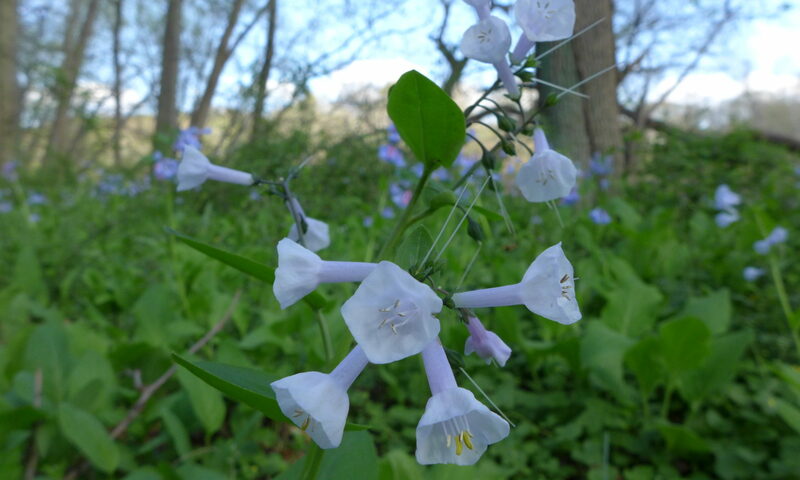 The hand-pulling method allows for an intimate assessment of the site conditions and preservation of the native plants, and is recommended for small infestations or isolated patches, especially in sensitive areas. 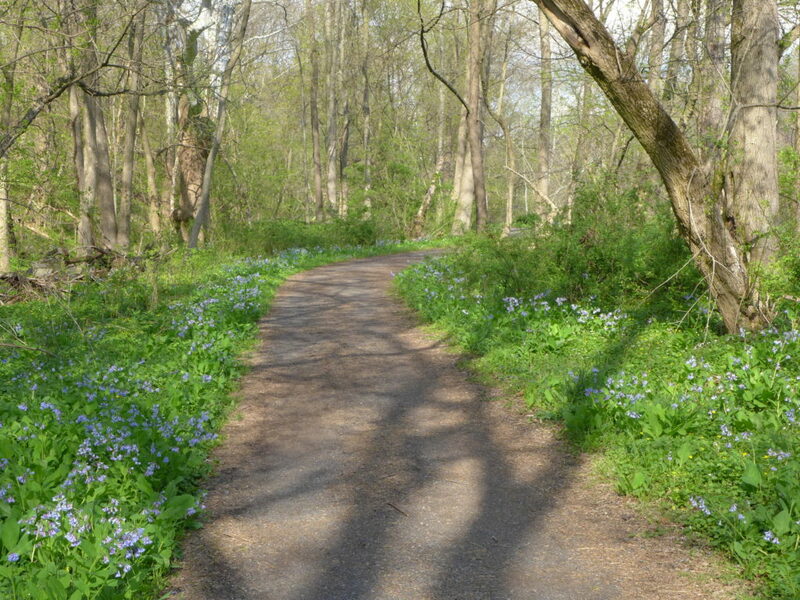 The area that was once dominated by this one species now has a variety of native plants and many signs of wildlife. 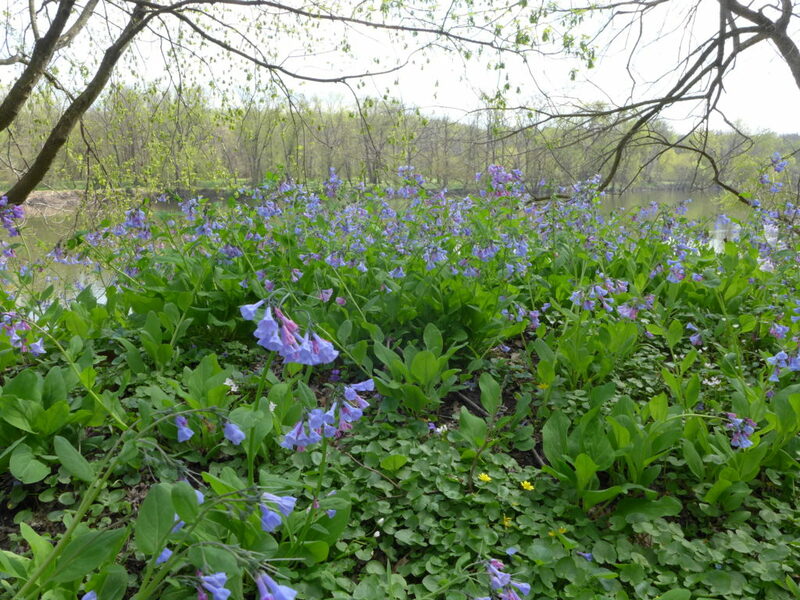 Mayapples, Goldenrods, Spring Beauty, Virginia Knotweed, Columbine, Bloodroot, Jack -in-The-Pulpit, Violets, Bluebells, Enchanter’s nightshade, Jewelweed and Asters now inhabit this site. Hummingbirds now buzz about and Robins can hop around it. There were a few isolated patches of Lesser Celandine that showed up this year, but about fifteen minutes of pulling and bagging by us volunteers took care of the problem for this year. Next year we expect a similar situation, it is all about maintenance. As far as the vast acreage covered by the Lesser Celandine, we have no removal experience to share, but something has to be tried. The thought of spraying vast amounts of wetland grade Glysophate herbicide is troubling, no doubt there will be damage done to other plants among other issues. Perhaps other methods could be investigated, if nothing else to bring the costs down? These are the big questions that make land managers throw their hands in the air in despair, which is why we choose to accentuate the priorities and reasonable solutions to them for professionals and for volunteers trying to protect natural areas from further damage from this invasive exotic introduction. We need to keep trying, even in ten by ten foot test areas, trying different methods of eradication. When we started out, we tried screening out the bulblets on different size screens, all in the effort to minimize and avoid soil loss- all of these efforts were a failure, but we tried. The simpler method of working after a heavy rain during peak bloom ended up being the simplest solution and the most sensitive to the soil, although it requires being there at the right time. Adopting a 10 by 10 square foot area in a volunteer capacity may be a viable option, little by little, we could take back our riparian areas! 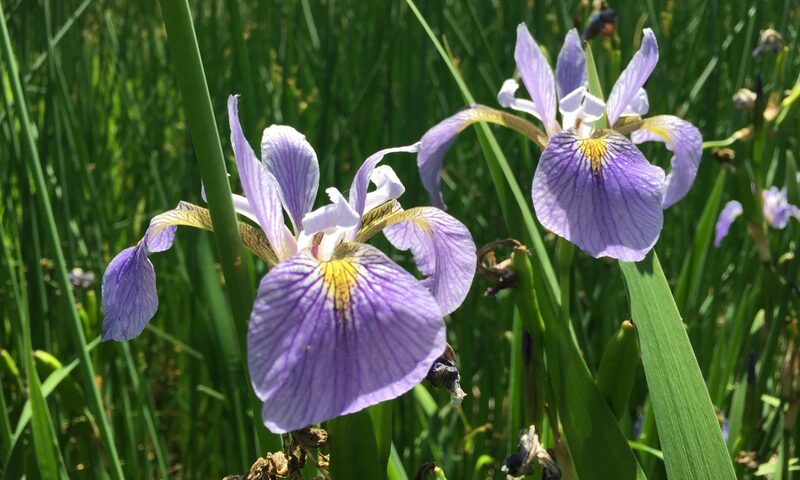 Because this plant goes dormant quite quickly, it is often forgotten for the next 40-45 weeks out of the year, and other concerns arise from the soil that demand our attention. However the damage that it does needs to be remembered, and just look at that dry barren land after it goes dormant!